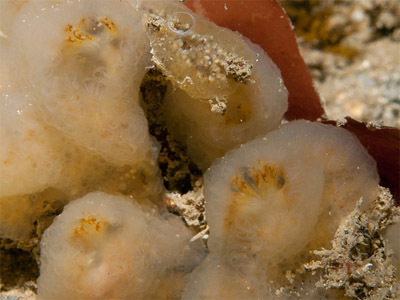 Description: A semitransparent colonial ascidian looking like a drop of jelly with small zooids and usually a single osculum-like cloacal opening. The colonies are usually unpigmented apart from some brown staining around the cloacal opening. The zooids are scattered throughout the colony apparently at random, forming no organised pattern. Colonies 15mm in diameter. 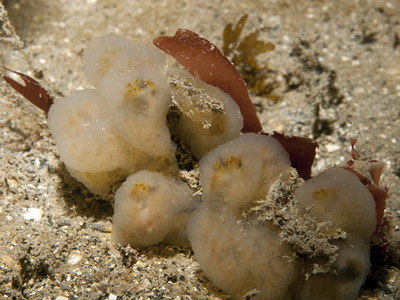 Habitat: Attached to rocks and seaweeds such as Halidrys siliquosa in moderately exposed places. Distribution: South and west coasts of the British Isles. Similar Species: The small zooids and soft appearance immediately distinguish this species from other polyclinids, but it may be mistaken for a didemnid, such as Diplosoma listerianum. 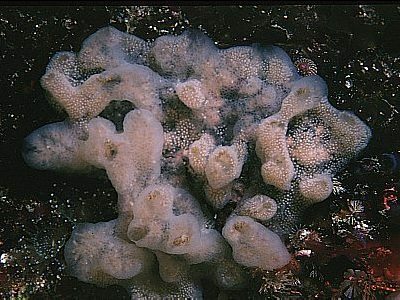 Discrete jelly-like colony with single exhalant opening. Small colourless zooids, half the size of other polyclinid zooids. Picton, B.E. & Morrow, C.C. (2016). Aplidium pallidum (Verrill, 1871). [In] Encyclopedia of Marine Life of Britain and Ireland.